Let’s face it, there aren’t many places outside of pre-school that you can get away with wearing welly boots, teeny tiny shorts, face paint and a chicken on your head. Luckily we have festivals to make all that socially acceptable. That in mind, here’s our VIP pass to the looks we wish we could rock every day thanks to a little inspiration from the SS13 shows. Those foil/glitter/leopard print/smurf gone crazy nails you’ve been hankering after for months are yours for the taking as, let’s face it, there’s no better place to flaunt them. Stick-ons are a great temporary option whilst glitter has the staying power of Imelda Marcos at a Louboutin sale. The ear is officially the new erogenous zone with ear cuffs spotted on the likes of Cara Delevingne, Rihanna and any other cool chick you care to mention. Granted, Rihanna is also partial to a pair of thigh high boots with little else to accompany them but this is one catwalk trend that’s ripe for rocking at a festival. It may of course pose problems for sleeping (who needs sleep anyway?) but no pain no gain as they say. 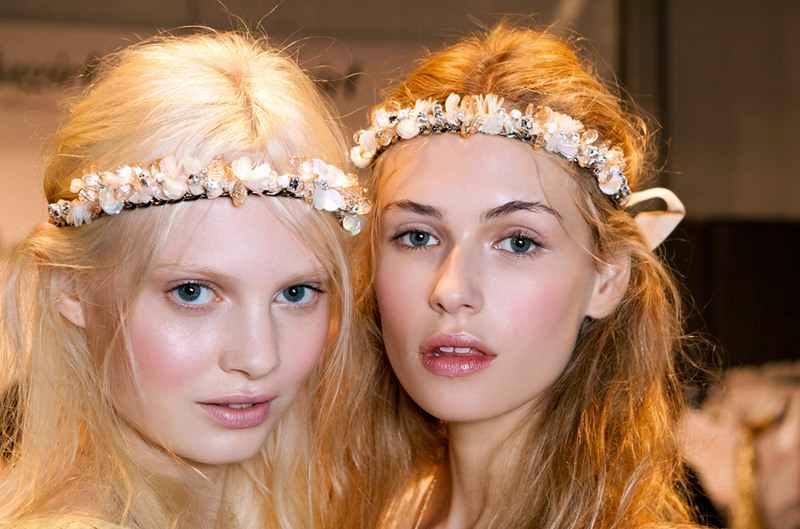 They may have worked a treat at Woodstock but these days floral headbands do seem, well, a little contrived, if we’re honest. Until we spotted the swoonsome garlands at Blugirl that is, which totally changed our minds. The key is to keep everything else looking understated with an effortless texture to the hair (which shouldn’t be too much of a push after a night in the dance tent). If you can’t don a bit of bling at a festival than quite frankly when can you? We loved the Swarovski-encrusted block-colour eyes spotted at Dior, but you don’t need to be a make-up maestro to execute this look as precision is not the aim of the game. 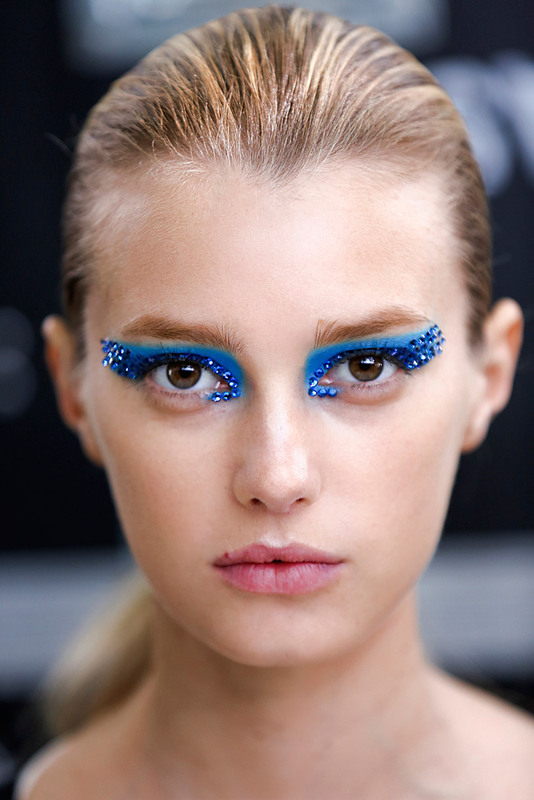 Shimmer, sparkle, or good old fashioned glitter, make sure you get ready to fa-jazzle up those features. The words ‘facial tattoo’ may sound a bit more Prisoner Cell Block H than festival chic but bear with us. 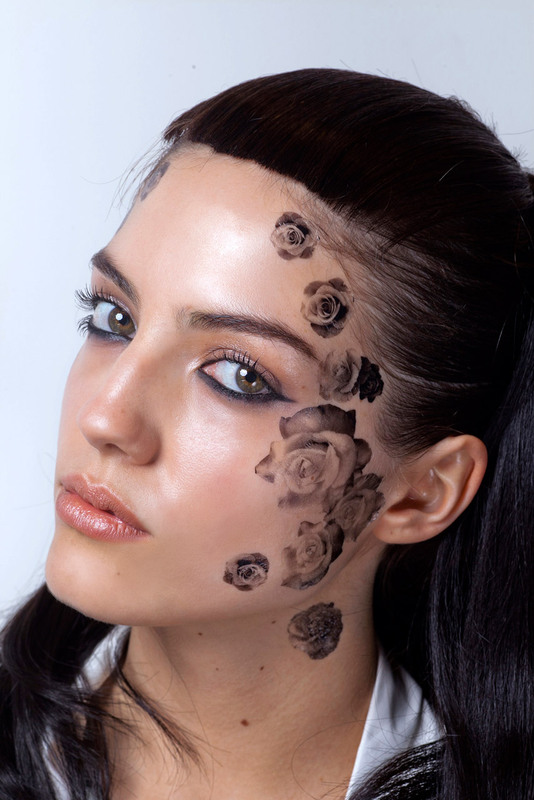 Over at Aminaka Wilmont, delicate black rose transfers were used to adorn the face for a pretty punk look with an ‘animalistic’ edge. Grrr. Your boss may not appreciate the complexities of the colour spectrum but your fellow revellers certainly will. 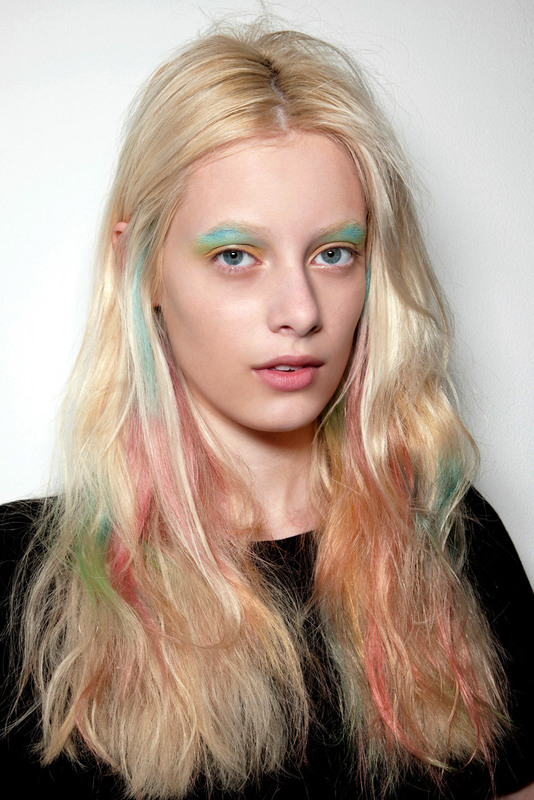 Get creative with hair chalks (as a wash out option these are guaranteed not to prompt a back-to-reality bout of hysteria) which can be used in streaks à la the pastel tendrils at Peter Som or for the brave as an all-over wash.
Faux follicles were spotted all over the SS13 catwalks and they’re not going away if AW13’s trends are anything to go by. The reality is that this isn’t a look we’ll be rocking in our local Sainsbury’s, but a pink wig reminiscent of Natalie Portman in Closer for a festival? We’re ordering the toupe tape as we speak! Conventional it ain’t, but we applaud the creativity of the two-tone lips at Holly Fulton (also a great look for the indecisive). 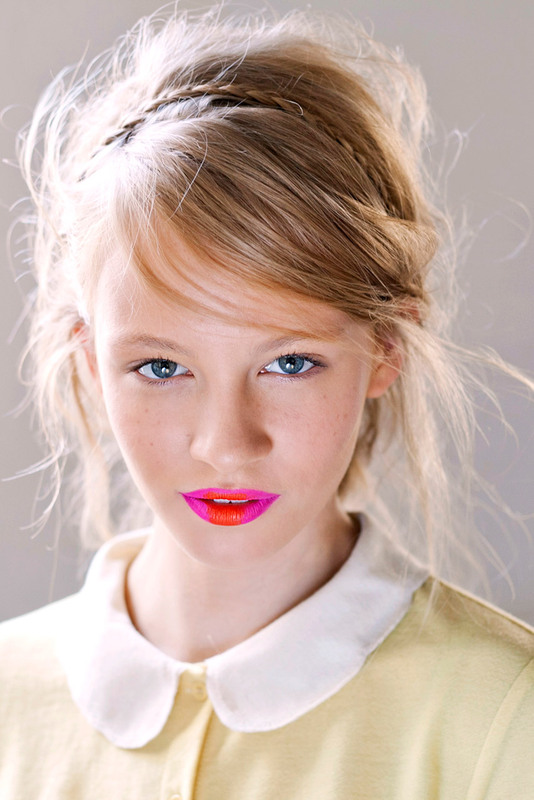 The bigger the colour contrast (preferably with a bit of a clash going on) the better, so pout it out loud. Falsies have been having a moment for a while now and these days adding a little oomph to your lashes isn’t something we bat an eyelid about. But glamping it up at a festival is just the excuse you need to rev up your lash appeal to stratospheric levels. Go bold, go brazen, and even go blue like the models at Moncler. Call a ceasefire on the war on frizz. Our attitude is, if you can’t beat ‘em, join ‘em, so reacquaint yourself with the ultimate 80’s hair tool and get crimping to recreate the mermaid-esque locks at Moschino. Heat? Humidity? Bring it on! DD CREAMS ARE COMING BUT WHAT THE HELL ARE THEY?